Oh the joys of spring, renewal, and another chance. 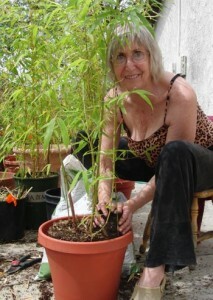 I am repotting the bamboo. Having been advised by many gardening friends that bamboo should not go into my backyard, as it will take over, I have kept it in pots, which together, form a nice, moveable hedge. Dividing it every year into new pots, means my hedge is growing. Plant abundance, a joy that every gardener knows. I ponder the qualities of bamboo – fast-growing, flexible, and very resilient to the force of wind. Bending wildly in gale force winds, bamboo resumes its tall stately shape when the storm has passed. Bamboo is hollow on the inside of its thick stem. The small leaves are lovely in their drooping angles and cross overs. Bamboo has endless uses: the shoots are delicious food for people and panda bears, the stems form excellent building materials for homes, furniture and tools. Bamboo flutes transform the human breathe into the sweetest sounds. Nowadays we even wear clothing soft and comfortable, made from bamboo. What’s more, throughout China bamboo is considered Lucky. Dividing the roots is not always easy. There has to be some surgery, sharp tools to separate the deeply entangled roots tucked into the now too-small pot. Where exactly to tear and cut for minimal damage? I recall The Secret Life of Plants, a book read some 30 years ago, of how plants are in relationship with the environment. I speak sweetly the bamboo, reassuring it that all is well, the pain of separating and relocating is brief, compared with the ease and space of the new container. Is the plant really screaming, I wonder? I tuck it in with new soil and a dose of Vitamin B1, rescue remedy for plant trauma! I want to be like bamboo: growing fast, (in consciousness, thank you, not in my body!) flexible, able to constantly adjust and adapt to the strong forces around me, to sing my note and, oh, yes, I’d like to be really useful too.